To provide a professional technical group to support all levels of competence of Process Analytical Technology within the Scandinavian region. Members are welcomed from industry (pharmaceutical, food, biotechnology, medical devices, etc. ), academia, regulators & suppliers industries. Provide a coordinated communication route from its members to and from all external parties (e.g. regulatory bodies, advisory boards, workshops, courses and speakers). Provide opportunity for discussions and reviews of technical guidelines. Efficient time management for its membership, by specifically providing a platform for: workshops, courses, symposiums, and speakers for members within Scandinavia. Exchange of knowledge with healthcare and non-healthcare professionals. Although the activities are financed by ISPE, the meetings are free and open to anyone with a sincere interest in sharing knowledge and discussing problems. Meetings:The Nordic PAT CoP has been active for several years but changed focus by 2007. The focus is now on providing practical tools for learning and implementing PAT. This is pursued in meetings where the content is very much driven by user input. 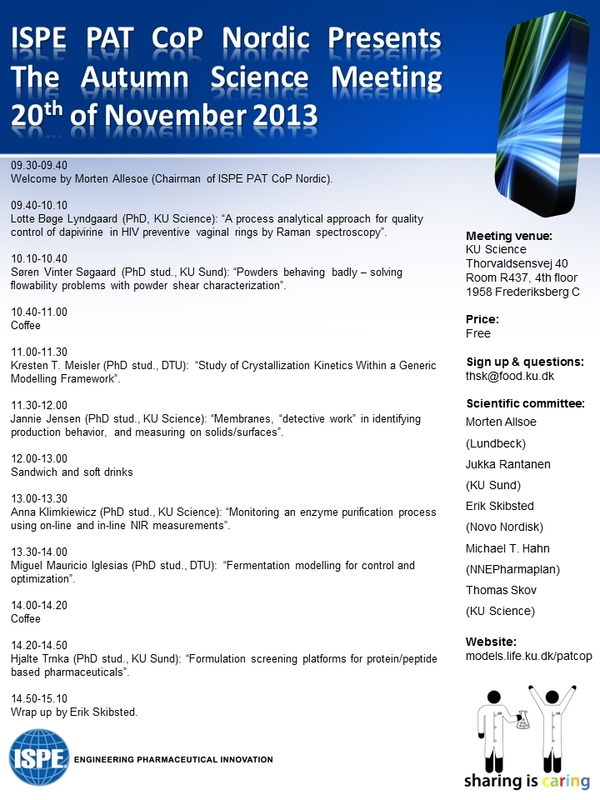 "The Autumn Science Meeting" November 20th 2013. PAT at Shell, Onno de Noord, Shell Global Solutions International B.V.